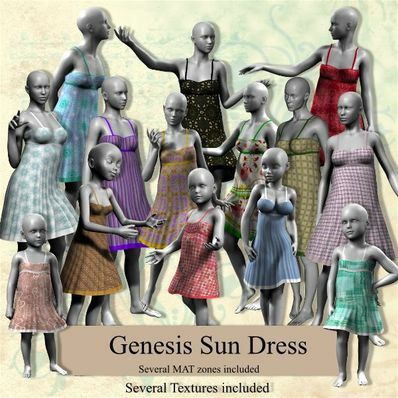 A Sun Dress for Genesis for use in Daz Studio 4. I have made some textures for the Long Nightie so it can be used as a Sun Dress. Will work with most poses and shapes. Thank you so much! You have so many lovely items here and I've downloaded some to try It's very kind of you to share them. Thank you so much for creating all of these designs. I'm just starting out, and this is a wonderfil place to start! TY TY! These are soo cute! Thank you so much and ofr the those great MAT zones.